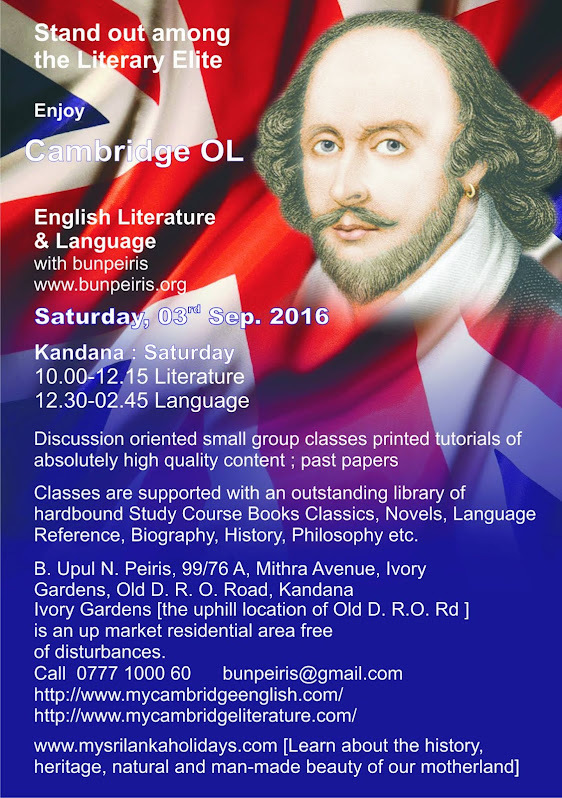 No single modern literary work has ever revealed to the West the beauty of Indian culture as Gitanjali has done. Gitanjali is a work of literature like none other: it is timeless and priceless. All the poems under the stars are fickle drops of glistening dew on the cusps of petals of flowers in the still wilderness, that would be swept away by the flimsiest of breeze; Gitanjali is the resplendent full moon that would stay still all throughout the loveliest of starry nights. In less than a year’s time since the English translation of Gitanjali, in 1913, Rabindranath Tagore (1861-1941) was awarded the Noble Prize for literature. 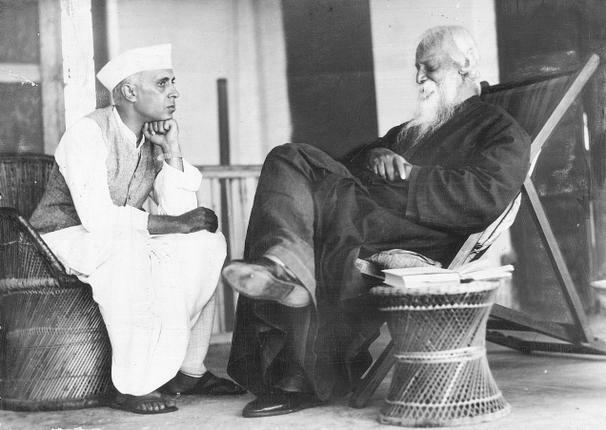 In spite of the Nobel Prize, Tagore was the poet’s poet as Leo Tolstoy was the novelist’s novelist. Irrespective of Noble Prize, Gitanjali is the noblest poem ever: it is a supreme work of literature, whose divinity and humanity wouldn’t be measured by a worldly reward, least of all, by the Noble Prize, of which, political neutrality has been eroded in the past couple of decades, especially in terms of the Noble Prize for Peace. Even on the matter of Prize for Literature, the fact that Leo Tolstoy, Thomas Hardy, Indian Master R. K. Narayan (1906- 2001), Narayan’s discoverer Graham Greene (1904-1991), English novelist Edward Morgan Forster (1879-1970) and English novelist William Somerset Maugham (1874-1965) were deprived of due recognition, has dimmed the halo of the Nobel Prize. 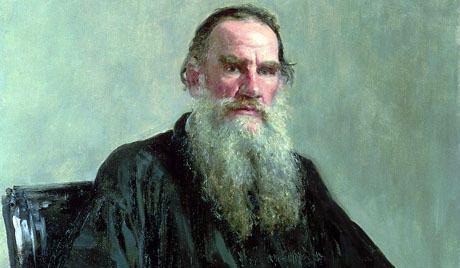 But then none of the winners was of the caliber of Tolstoy; Novelist Tolstoy was Tolstoy. He was of his own class as the poet Rabindranath Tagore was. Hence the Indians and lovers of R. K. Narayan needn’t be overly sulky: the ultimate honor for a novelist, is to be in the company of Tolstoy. 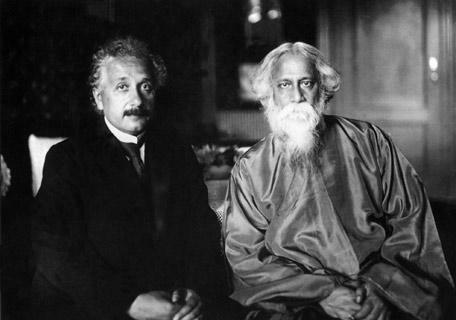 Nevertheless, the Noble Prize brought in great publicity upon Gurudev Rabindranath Tagor: it was the first time a non-western writer was so honored. Overnight, the peerless poet, the supreme humanist philosopher of modern era became the leading light of the world espousing the cause of a multi-cultural world in the world stage. 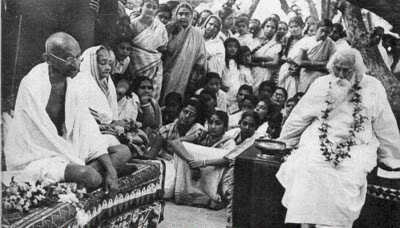 In India, on a spiritual plane, Tagore was the modern-day sage; on the temporal level, he was an educationist who embodied the best of traditional Hindu education with Western ideals. Rabindranath Tagore was a Bengali poet who wrote stories, plays and songs in his mother tongue, Bengali. He wasn’t much known in India, not to mention overseas. In 1912, though sans great expectations, Tagore translated his latest poems, Gitanjali from Bengali to English on a small notebook during a sea voyage with his son to England. 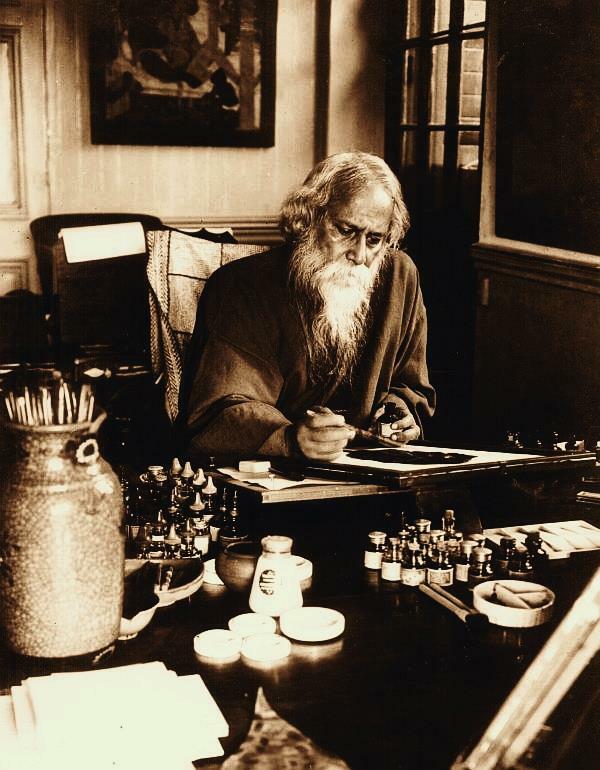 In London Tagore’s briefcase containing the note book, among other things was left behind in the London subway. 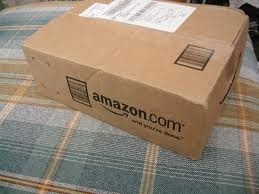 By providence, the brief case was recovered in the following day. British artist Sir William Rothenstein (1872-1945), a friend of the family of Tagore in Calcutta (1911), having heard of translation, persuaded a reluctant Tagore, to reveal the translation. Having taken by surprise, on July 7, 1912, William Rothenstein had his friend William Butler Yeats read the poem in his rented house in Hampstead. Irishman W. B. Yeats, the foremost poet of his era in England, found himself enthralled in the poem. 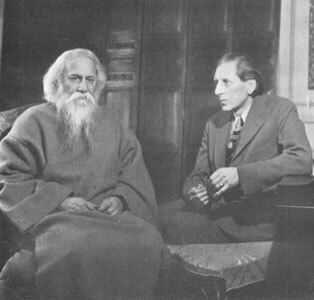 On November 1, 1912, the India Society in London published a limited edition (750 copies, of which 500 were for the members and 250 for the general sale) of Gitanjali: Song of Offerings containing English translation of 103 poems, with an introduction by Yeats and a pencil-sketch of Tagore by Rothenstein. 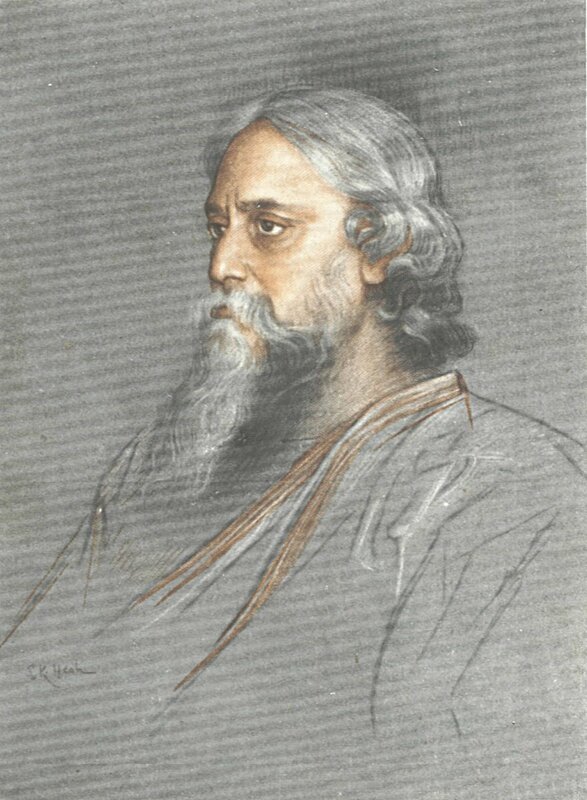 Rabindranath Tagore dedicated the publication of English translation of Gitanjali to William Rothenstein. William Butler Yeats went on to win Nobel Prize for Literature a decade later, in the year 1923. Tagore, knighted by King George V in 1919, renounced his Knighthood following the massacre of over 400 unarmed civilians at the public garden of Jallianwala Bagh, Amirtsar in the Punjab state of India by the British colonialists in India. 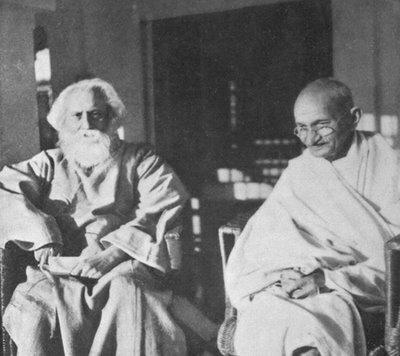 In spite of good rapport with Mahatma Gandhi (1869-1948),the leading light of Indian nationalism, in spite of renouncing British atrocities in India, Tagore wasn’t deeply involved in politics. He wasn’t a political activist as Gandhi was. His main activities were confined to delivering lectures around the world and expansion of his university that he sustained with his own funds that he collected by from his never ending writing, composing and lecturing. Tagore was a sage.Tagore was the maker not only of modern Indian literature but also the modern Indian mind. He would refuse to fall before god begging for salvation. He upbraided Mahatma Gandhi for declaring that a massive 15 January 1934 earthquake in Bihar, India leaving thousands dead, was divine retribution brought on by the oppression of Dalits of India. Tagor was a humanist who wouldn’t accept that divinity, if that existed, would be bent upon, punishing the humanity. Though born to a prominent Brahmin family in Bengal, Tagore was never a staunch proponent of Hinduism. In fact, at his own Visva-Bharati a public central university located at Santiniketan, West Bengal, Tagore had Mahayana Buddhism, Theravada Buddhism, and Pali language in its streams of learning. I have been asked to let you know something about my own view of religion. One of the reasons why I always feel reluctant to speak about this is that I have not come to my own religion through the portals of passive acceptance of a particular creed owing to some accident of birth. I was born to a family the members of which were pioneers in the revival in our country of a great religion, based upon the utterances of Indian sages in the Upanishads. But, owing to my idiosyncrasy of temperament, it was impossible for me to accept any religious teaching on the only ground that people in my surroundings believed it to be true. I could not persuade myself to imagine that I had a religion simply because everybody whom I might trust believed in its value. Above song is the Sinhalese rendition of Poem No.11 of Gitanjali given below. He is there where the tiller is tilling the hard ground and where the path maker is breaking stones. Rabindrnath Tagore was a champion of the notion of “One World” that makes his name live forever. The following poem from Gitanjali [Song offerings] brings together the ideals Tagore presented to India and to the entire humankind. Where the mind is led forward by thee into ever-widening thought and action. In the year 1971, co-founder of Rock Music Band Beatles (John Lennon, Paul McCartney, George Harrison, and Ringo Starr) (1960-1970), John Lennon (1940-1980), whose solo album sales as at 2012 exceeded 14 million units, was to echo Rabindranath Tagor’s dream of unbroken world; a world at peace, without the divisiveness and barriers of religions and nationalities. Here is the Anthem of Peace. The Killing Fields are a series of mass graves of Cambodians subjected to genocide by the Khmer Rouge regime, during its rule of the country from 1975 to 1979, immediately after the end of the Cambodian Civil War (1970-1975). DC-Cam Mapping Program and Yale University indicate at least 1,386,734 victims buried in 20,000 mass graves. Estimates of the total number of deaths resulting from Khmer Rouge policies, including disease and starvation, range from 1.7 to 2.5 million out of a population of around 8 million. In 1979, communist Vietnam invaded Democratic Kampuchea and toppled the Khmer Rouge regime. It was a spillover of Vietnam war (1955-1975) in which Americans bombed Indo China for for two decades day after day: 6,727,048 tons of bombs, more than twice the quantity of bombs dropped by Allies in the European theater and Pacific theater in the Second World War. Cambodian journalist Dith Pran coined the term "killing fields" after his escape from the regime. A 1984 film, The Killing Fields, narrates the story of Dith Pran, played by another Cambodian survivor Haing S. Ngor, and his journey to escape the death camps. Rabindranath Tagore’s Gitanjali was thrice translated into Sinhala, the language of Sinhalese of Sri Lanka by three Sinhalese writers: Prof. Vinnie Vitharana, Kusum Dissnayake (wife of Dr. J. B. Dissanayake) and Edmund Jayasuriya. Edward Jayasuriya’s translation carries an introductory text by illustrious Sri Chandraratne Manawasinghe (1913-1964) of the village of Puwakdandawa in Ruhunu Giruwapattuwa off Sri Lanka Holidays Tangalle. Quote Lakshman Kadirgamar Institute for International Relations and Strategic Studies, Colombo, Sri Lanka 12th June 2012. Tagore’s fascination with Sri Lanka can be attributed to two factors, Dr Sandagomi Coperhewa said: his awareness of the Sinhalese people and culture having descended from immigrants from Bengal region in ancient times and due to his profound respect for Theravada Buddhism and the Buddhist heritage of the island. One recalls Tagore’s song about the Buddha, “Please be born again….” (two lines loosely translated being: “The world today is wild with the delirium of hatred, All creatures are crying for a new birth of thine”). Tagore was also aware of Angarika Dharmapala’s (1864-1993) pioneering Buddhist revival work in India, and the Maha Bodhi Journal (1892) started by Angarika Dharmapala was patronized by Indian intellectuals such as Tagore who contributed articles and poems to it, and needless to say, Angarika Dharmapala had great respect for Tagore. While in India, Sri Lankan art critic and historian Ananda Commaraswamy (1874-1947) also formed close relationships with the Tagore family and was involved in both the literary renaissance and the Swadeshi movement-an early phase of the struggle for Indian independence. Tagor’s first visit to Sri Lanka was said to be when he was a student at the University Of London, England. 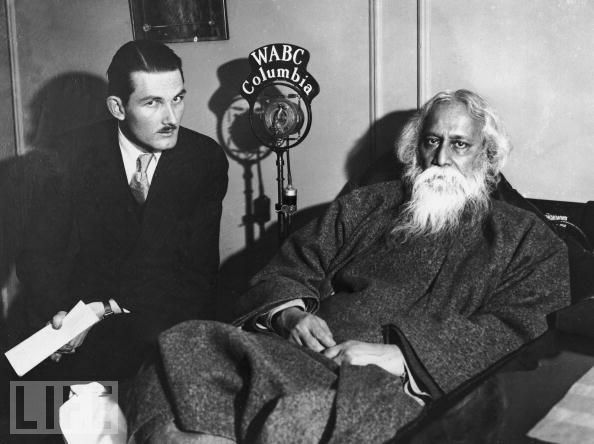 Tagore's subsequent visit to Sri Lanka in 1922, 1928 & 1934 have been well recorded. 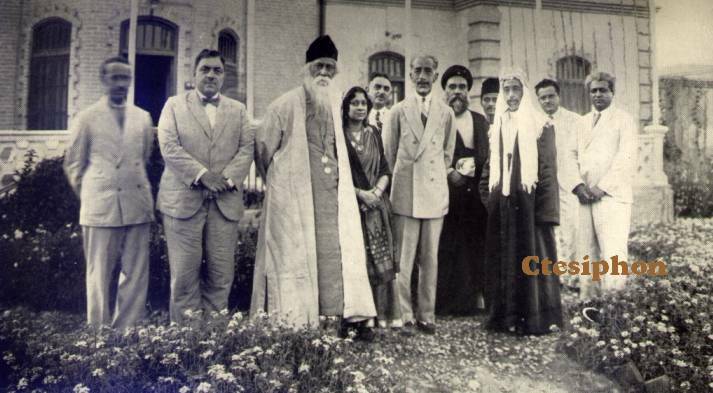 Tagore’s visit to Sri Lanka in 1922 and 1928 were mainly owing to Buddhist Heritage of Sri Lanka. It is also recorded that Tagore availed the opportunities to introduce his concept Visva-Baharat, a school of art and literature. Tagore’s visit to Sri Lanka weren’t confined to intellectual circles in Colombo: he visited some of the key cultural attractions of Sri Lanka Holidays: Kandy, Anuradhapura, Galle and Matara. During his visit in 1928, Tagore, in spite of his poor health, took part in Vesek festival in Sri Lanka Holidays Anuradhapura.